The Indian National Badminton Championships have, after a gap of nine long years, become meaningful again, with every single one of the top players in the country taking part in both the ongoing Inter-State Championships and the individual events that will follow at the Divisional Sports Complex in Mankapur, a Nagpur suburb. Whatever, or whoever, has induced the compulsion for the elite players to play in the 82nd edition of the Badminton Nationals at Nagpur – whether it is gentle pressure exerted by the Badminton Association of India’s (BAI) new president, Himanta Biswa Sarma, or the ten-fold hiking of the prize money amount from Rs 6 lakh to Rs 60 lakh – the move is in the best interests of Indian badminton, for now, the winners can revel in their national champion status with pride at the international level. The revival of the country’s premier badminton tournament was sorely required for, until it became devalued after 2008, it was always the nursery of the country’s shuttling talent, and the main competition to put together the team that would defend the country’s honour in international competitions like the Thomas and Uber Cup. It would be impossible to think of Indian cricket without the Ranji Trophy, but it had become possible to think of Indian badminton without the Nationals. In the period between 2008 and last year, the Nationals had been woefully denuded of the big names, all of whom had chosen to stay away for one lame reason or another. For example, Saina Nehwal, who won the women’s singles title twice in a row in 2006 and 2007 (immediately after a nine-year reign by Aparna Popat), stayed away from the following year, and has not participated in the Nationals since. In her absence, the path was cleared for lesser players like Trupti Murgunde, Sayali Gokhale, Aditi Mutatkar, PC Thulasi, et al, to inscribe their names on the trophy. They were all decent players, no doubt; but they could not make their mark on the international scene. PV Sindhu won on both the occasions that she took part – in 2011 and 2013 – but did not participate in the three editions that were played thereafter. It is a fact that the elite shuttlers from the country, most of whom have been trainees at the Pullela Gopichand Academy in Hyderabad, have never been pressurised to play in the national competition. More often than not, their annual schedules were drawn up without taking the Nationals into account; and the academy would make a token concession by allowing one or two of the trainees to take part. Thus, it was that the Verma brothers have participated in the past two Nationals, with Sameer, the younger of the two lads from Dhar (Madhya Pradesh), winning the title in 2015-16, and his elder brother Sourabh claiming the mantle from his younger sibling earlier this year in Patna. But there was no participation from the likes of Kidambi Srikanth, HS Prannoy, B Sai Praneeth, Parupalli Kashyap, Ajay Jayaram and RMV Gurusaidutt, as also from Saina and Sindhu. Although all these players were not ranked in India, since they did not play the prescribed minimum number of all-India ranking tournaments, it mattered little to them, for they were more bothered about the Badminton World Federation (BWF) ranking points they earned by participating in international tournaments going down from the Superseries Premier and Superseries, to the Grand Prix Golds and Internationals. As on the world tennis circuit, the higher a player’s ranking, the better his or her chances of gaining direct entry into major competitions. Those that were on the periphery of the rankings that allowed automatic entry were required to take part in the qualifying competition that was held a day prior to the start of the main tournament. Those that were still lower down in the rankings were denied entry to either the main draw or the qualifying rounds. 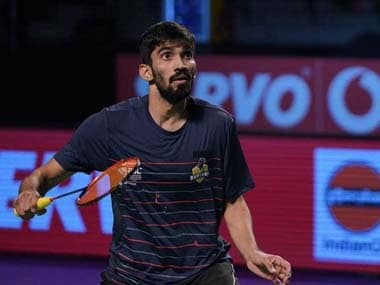 In the latest BWF rankings, India has as many as four male players in the top 20 – Srikanth (ranked No 2, behind Denmark’s Viktor Axelsen), Prannoy (11), Sai Praneeth (16) and Sameer Verma (18), with Jayaram and Sourabh Verma lurking on the periphery, in the 21-30 bracket. Among the women, PV Sindhu (ranked No 2, behind Taiwan’s Tai Tzu Ying) and Saina Nehwal (11) figure among the top 20. With so many Indian players doing so well at international level, it has allowed Indian badminton to go through one of its best-ever phases. Not since the excitement generated by Prakash Padukone winning the All-England men’s singles title in 1980, or Pullela Gopichand bagging the All-England crown in 2001, or Saina Nehwal winning the silver medal in the 2015 World Championships, has the game gained so much of a mass following in the country. 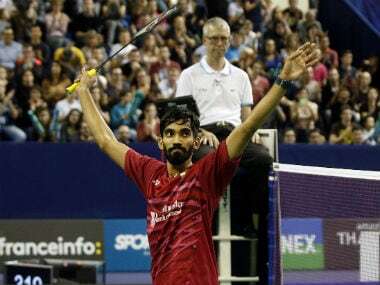 It is only fair that the badminton-loving public at large gets an opportunity of watching the top Indian stars in action on their home turf – and what better setting than the Nationals. The results of the sterling efforts of the BAI president and the top bosses of the Maharashtra Badminton Association were there for all to see – for the vast stadium at Mankapur was packed to the rafters from 1st November, the very first day of competition for the Inter-State championship. The fact that two outstanding contributors to Indian badminton from Maharashtra – doubles expert Chandrakant Deoras, who formed a world-class combination with the legendary Nandu Natekar, and all-rounder Pradeep Gandhe, winner of two bronze medals in the 1982 Asian Games in New Delhi – are to be felicitated with Lifetime Achievement awards has been, for the spectators, the icing on the cake. The individual events kick off from Saturday, and go through until Wednesday, 8th December. The elite players will be seen in action from Sunday, for the top eight ranked Indian players/pairs (on the BWF computer) have been given byes until the pre-quarter-final stage. Thus, eight of the best of the rest in each of the five events will get the opportunity of matching their wits against the stalwarts. It would be worth watching out for the performance of the world’s top junior and Prakash Padukone Badminton Academy trainee, 16-year-old Lakshya Sen. The young winner of the Bulgarian Open earlier this year is strongly favoured to give the established stars a run for their money.